Click the button below to add the Batik patterned cushion cover to your wish list. Batik is both an art and a craft, which is becoming more popular and well known in the West as a wonderfully creative medium. The art of decorating cloth in this way, using wax and dye, has been practised for centuries. Each batik product is a unique original. No patterns are used. Therefore, the design of each batik product depends upon the artisan who makes it. Because it is naturally dyed, we recommend hand wash individually in cold water to minimize bleeding. By buying this product, you are enabling a remote and needy group of Hmong women to continue a traditional Hmong skill and make a respectable living. CAMACRAFTS is a non-profit, self-help project which markets handicrafts from the Lao P.D.R. CAMACRAFTS strives to provide a sustainable method of income for village women that would otherwise be unavailable. 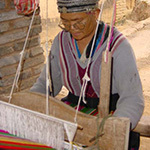 CAMACRAFTS’ handicraft products are entirely handmade by Lao and Hmong village women who use traditional patterns and techniques. CAMACRAFTS strives to preserve the traditional needlework skills of Hmong and Lao women, such as Hmong appliqué, cross stitch, embroidery, and batik. CAMACRAFTS is a certified member of World Fair Trade Organization.